For a brief history of Stampede fashion, you can read the 2006, 2007, 2008, 2009 and 2010 round-ups. OH MY GOD! Will and Kate looked absolutely dashing!!! So young! So thin! So beautiful! And they pulled off Western wear more perfectly than most people who have lived in Calgary their entire lives! Their outfits were, like, so simple, and yet so perfectly perfect. I hereby crown them "best dressed" of the 2011 Stampede - the king and queen of fashion. This was Naheed Nenshi's first stampede as mayor, and I know many were worried how the man would look in western wear. After all, Dave Bronconnier left big cowboy boots to fill - the man looked the part of the Mayor of Calgary every Stampede, riding 'ol leroy down 9th Avenue. Nenshi meanwhile, went to Harvard, is a University Professor, and spends his spare time blogging about population density rates in new housing developments. And let's be honest, the man doesn't really look like John Wayne (neither the actor nor the serial killer). However, Naheed hit it out of the park this year. 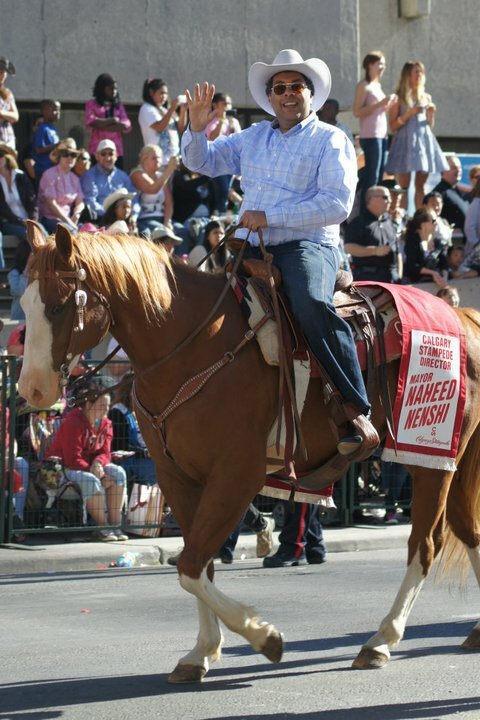 His outfit is irrelevant - the man rode a horse in the parade, thereby making him a Stampede All-Star. With Stampede a success, the big question now turns to what he'll wear for pride. Usually it's the federal politicians who make the biggest splash at the Stampede - for better or worse. After all, Liberal academics, socialists from Toronto, and environmental crusaders don't tend to have a large collection of denim in their closets. 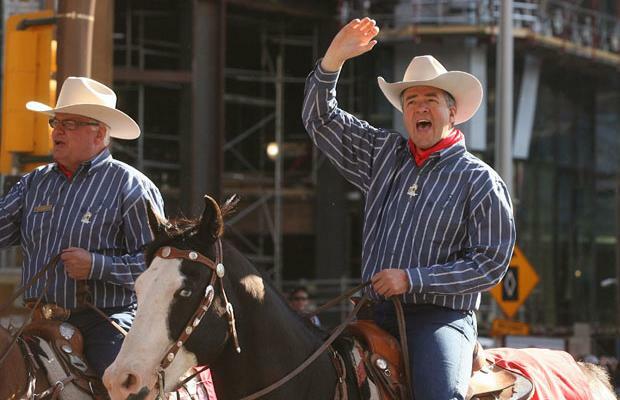 Heck, even the "Alberta boy" himself, Stephen Harper, committed the biggest gaffe in Stampede history. But this year? Everyone's tired out from the election. Jack Layton needs to spend time with Quebec. The Liberal leadership contest hasn't reached the point where candidates need to parade in cowboy hats to court Calgary Liberals. Stephen Harper did give a speech about how invincible he is (which always ends well in westerns...), but his stylist really earns her money come the second week of July every year, so the PM once again looked fine. "Here's a pancake. You'll get your eggs once Canada is out of deficit in 2015." In comparison, provincial politics are rockin' this summer with an election on the horizon, and the PCs and Liberals both in the midst of leadership contests. As always, the media was all abuzz about the chosen one, Wildrose Alliance leader Danielle Smith. 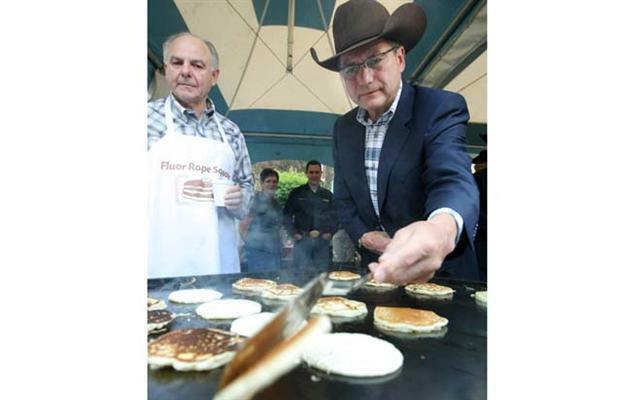 And 5,000 came to the Stampede breakfast, but there were only 5 pancakes and 2 sausages. So Danielle Smith said "bring them to me" and she placed her hands over them. She broke the pancakes and gave them to Prime Minister Harper, telling him to distribute them to the multitudes. Lo and behold, they were all fed, with stacks of pancakes left over. And so the legend of Danielle Smith grew. The Stampede may be the most important event of the entire PC leadership race. After all, it gives candidates a dozen socials a day to press the flesh in Alberta's largest city. 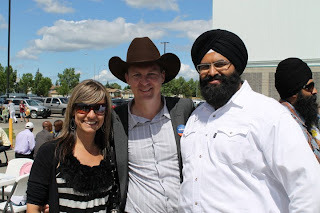 As such, the contenders have all no doubt held countless strategy meetings and focus groups to find that outfit that says "I'm an Albertan, I enjoy a good rodeo, but I don't look like a member of the Village People when wearing a cowboy hat". 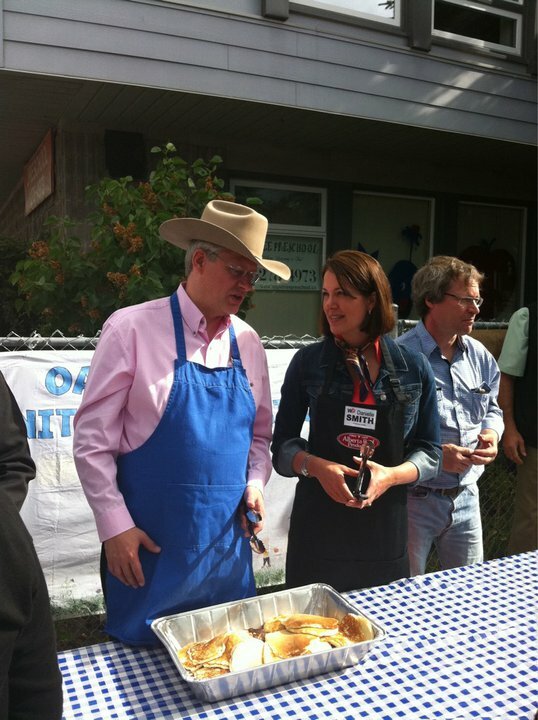 So as a public service, I've taken it upon myself to rank the PC leadership contenders choice of western wear. Winning the "Calgary Grit Best Dressed" trophy will likely be the highlight of the leadership race for Orman, so I hope he savours this. While Orman's outfit isn't Jim Prentice-good by any means, it's the best of a rather uninspiring field. And he gets bonus marks for the 3 cute children in western wear. After all, in politics, nothing beats cute children. Redford has a bit of a "female Harry Chase" look going on. I know that doesn't sound like a compliment, but it really is, since I consider Chase a stampede fashion superstar. Morton has improved this year, though I'd probably only give the prof a "C-" grade, and the vest above leaves a lot to be desired. However, in browsing the 7 Stampede Breakfast photo-albums on his Facebook page, I did notice he mixed it up and owns at least 2 different cowboy hats, so I'll give him marks for effort. Here, PC leadership candidate Gary Mar poses with the winner of the Gary Mar lookalike contest. 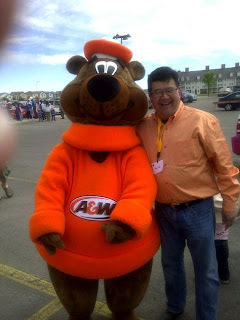 While I recognize orange is a hot colour politically these days, I'm just not feeling it. I mean, seriously, have you ever seen Clint Eastwood wearing orange? Mercifully, Ed Stelmach no longer wears suit jackets to the Alberta Stampede, but his habit appears to have rubbed off on a few of his MLAs. Quite simply, it's just something you don't do. Like Griffiths, Horner dons the suit. What knocks him down to the "worst dressed" spot on this list is the cup of Starbucks in his left hand. Quite simply, cowboys do not drink Starbucks. It appears Yvonne Fritz is equally aghast. I agree the media went overboard on the Will and Kate stuff, but they do look quite good in their western duds! By Deb, at 10:19 a.m.
Did Rae not go to Calgary this year? I thought he was doing a cross country tour. By Sean, at 11:52 a.m.
@Sean: I believe he's here today (and gone tomorrow?) CG:it's too, not to and you made the same mistake last year with Morton! You must have cut and pasted. By Brian Wells, at 2:54 p.m. I love how our community, city, province, everything comes together for Stampede! :) Such a wonderful experience year after year! By Elsie, at 4:42 p.m.
By The Invisible Hand, at 11:20 p.m.
By John, at 7:02 a.m.
By chenlina, at 8:11 p.m.
By chenlina, at 8:35 p.m.
By chenlina, at 9:57 p.m.
By jeje, at 11:23 p.m.
By GIL BERT, at 9:29 p.m.
By happy 123, at 1:32 a.m.
By happy 123, at 7:42 a.m.
By raybanoutlet001, at 1:22 a.m.
By 郑佳颖, at 3:03 a.m.
By raybanoutlet001, at 9:12 p.m.
By jeje, at 11:38 p.m.
By اخبار افغانستان, at 5:25 a.m.
By اخبار افغانستان و جهان, at 5:26 a.m.
By dipali sharma, at 1:04 a.m.
By Yaro Gabriel, at 1:40 a.m.
By Yaro Gabriel, at 1:56 a.m.
By raybanoutlet001, at 4:04 a.m.
By Pansys Silvaz, at 11:58 p.m.
By Unknown, at 2:57 a.m.
By Anonymous, at 12:54 a.m.
By خانه طراحان سام, at 7:19 a.m.
By Cara Mengobati Radang Pembuluh Darah, at 12:15 a.m.
By Yaro Gabriel, at 10:40 p.m.
By Online Biology Homework Help, at 1:14 a.m.
By Brown University Theses Help, at 1:20 a.m.
By Columbia University Theses Help, at 1:28 a.m.
By Cornell University Theses Help, at 1:38 a.m.
By Dartmouth College University Theses Help, at 1:46 a.m.
By Course Online Help, at 1:58 a.m.
By Duke University Theses Help, at 2:08 a.m.
By Edinboro University of Pennsylvania Theses Help, at 2:17 a.m.
By Harvard University Theses Help, at 2:27 a.m.
By Johns Hopkins University Theses Help, at 2:36 a.m.
By Massachusetts Institute of Technology Theses Help, at 2:48 a.m.
By Northwestern University Theses Help, at 2:59 a.m.
By Buy Harvard Business Ocean Carriers Case Studies Solutions, at 4:13 a.m.
By Programming Online Help, at 4:27 a.m.
By do my online exam, at 4:44 a.m.
By Princeton University Theses Help, at 4:57 a.m.
By Stanford University Theses Help, at 5:19 a.m.
By Syracuse University Theses Help, at 5:37 a.m.
By Texas A&M University Theses Help, at 5:53 a.m.
By University Of Chicago Theses Help, at 6:04 a.m.
By Vanderbilt University Theses Help, at 6:16 a.m.
By Amanda Stephanie, at 3:25 a.m.
By website designer, at 7:56 a.m.